Living in Washington, D.C. can lead to a bit of an identity crisis – invariably when someone asks me where I am from I answer Boston immediately and then clarify that I live in DC. However, next year will mark the year I have actually lived longer below the Mason Dixon line then I ever lived in New England. Most Southerners will tell you that absolutely does NOT make me Southern and that’s ok by me. I am going to try and continue my mix of the best of both worlds – reading my Southern Living magazine on my front porch with some iced tea wearing my Red Sox hat. One thing that I have always admired and tried to emulate though is the Southern hostess’s way of making people feel welcome and comfortable even if it’s 100 degrees outside. I am learning that the key is making sure that the food isn’t too formal, that you make as much as possible in advance and that you lean heavily on comfort foods. That perfectly fits my entertaining mode so I threw together this Southern dinner party so we could beat the heat and catch up with friends. Southern summers are so hot that going out to dinner actually becomes a chore, where as this delicious meal is made mostly in advance and with the help of a slow cooker that won’t heat up your house. And who doesn’t love a party where you eat corn nuts out of a silver bowl??? Southern entertaining at it’s best. These bite size appetizers are insane. Spicy, salty, sweet, cheesy, crunchy, meaty. It leaves nothing out and none will be left behind. I served these with a bowl of corn nuts and that was it for the first course – dinner is pretty hearty so don’t front load the first course. A great selection of craft beers or a crisp sauvignon blanc would be a good pairing for these bites. When you read this recipe you are either going to think it sounds like the best thing ever invented or totally disgusting. The first group is correct. This large beef roast is cooked in a slow cooker with basically ranch dressing for over 6 hours to become meltingly tender and delicious. This recipe has been around for a long time but to those of us outside of Mississippi it took the New York Times of all publications to bring it back in vouge. It really is incredible and not at all greasy. If you have leftovers they would make for an amazing sandwich. Make sure to have extra pepperoncini on hand to serve alongside the roast. Mashed potatoes seemed like a natural side for the roast but this version by Country Living actually makes for a lighter and brighter side perfectly contrasting the meat. The addition of lemon peel while cooking the potatoes and using creme fraiche instead of a ton of butter and cream makes this one of my go to potato dishes. This quick cooking side was featured in its own post in June and has been shown a lot of love since. Any roasted or even grilled vegetable would make a great side here but I like the simplicity and the fast that all you need is a broiler rather than a 400 degree oven. It wouldn’t be a Southern party without a little bourbon and the use of a cast iron skillet! These single serve peach crumbles are so good and can be made way in advance. Once dinner is over move every one to the living room or a porch if you have one for an after dinner drink and pop these in the oven. People will love that they each have their own dessert and the sweet peaches are the perfect note to end the night on. Years ago when Patrick and I were registering for our wedding at one of our favorite local shops, Hill’s Kitchen, I spotted these precious mini cast iron skillets. What does a girl who already has everything register for?? Ridiculously cute and not very sensible baby sized pans. Leah, the owner, convinced us both of their utility (she is a genius like that) and on the registry they went. I will admit I don’t use them daily but when I do they put a smile on my face. This peach crumble would of course work in ramekins or in one large pan (I would think a 8 by 8 inch baking dish) but just like how cupcakes are more fun than a cake, these individual crumbles will really wow your guests. If you aren’t near Hill’s Kitchen you can also find them online. They are also great to use as serving dishes for nuts, olives and the like or doing mini frittatas. Buy them first and find more uses for them later! This crumble recipe is super easy and could be adapted for whatever you have on hand – berries, apples etc. Just keep on eye on how much liquid your fruit is giving off. Since I used frozen peaches they were wetter than say fresh ones – another splash of bourbon or a knob of butter should fix that problem. Basically you want the fruit to have a nice glaze on it but not be sitting in liquid before you add them to the pan. Also sharing another good hint here – grating butter. For a simple topping like this where you want the butter to distribute evenly through the dry ingredients you can use a food processor and pulse them together or just pull out the handy box grater and grate in super cold butter. Do it quickly and you will get small pieces of butter that works perfectly in this topping. Make them up to two days in advance, keep them in the fridge and then just pop them in the oven (don’t forget the ice cream!). Preheat your oven to 350 degrees. In a large skillet melt 2 tablespoons of butter over medium high. Add the peaches and 2 tablespoons of sugar and cook for 7 minutes until the peaches take on a little color and the butter and sugar melt into a syrup. Carefully add the bourbon and cook for another 30 seconds. Remove from the heat. Line a baking sheet with aluminum foil and equally divide the peaches among the 4 mini skillets on the baking sheet. In a medium sized bowl combine the flour, 1/3 cup of sugar, salt and cinnamon. Take the remaining 4 tablespoons of butter cold butter and grate the butter into the bowl. Add the oats and stir to combine. Equally pile the crumble topping on top of the peaches, making sure to cover all exposed peach. Some will fall off on the baking sheet which is fine (that’s what the foil is for!). At this point you can place the skillets in the fridge for several hours before baking them off if you want to make them in advance. Bake for 30 minutes at 350 degrees until the crumble is lightly browned. Remove from oven and let cool for several minutes then top with ice cream and serve. Preheat your oven to 350 degrees. In a large skillet melt 2 tablespoons of butter over medium high. Add the peaches and 2 tablespoons of sugar and cook for 7 minutes until the peaches take on a little color and the butter and sugar melt into a syrup. Carefully add the bourbon and cook for another 30 seconds. Remove from the heat. Line a baking sheet with aluminum foil and equally divide the peaches among the 4 mini skillets on the baking sheet. In a medium sized bowl combine the flour, 1/3 cup of sugar, salt and cinnamon. Take the remaining 4 tablespoons of butter cold butter and grate the butter into the bowl. Add the oats and stir to combine. Equally pile the crumble topping on top of the peaches, making sure to cover all exposed peach. Some will fall off on the baking sheet which is fine (that’s what the foil is for!). At this point you can place the skillets in the fridge for several hours before baking them off if you want to make them in advance. Bake for 30 minutes at 350 degrees until the crumble is lightly browned. Remove from oven and let cool for several minutes then top with ice cream and serve. Since today is my mom’s birthday (happy birthday mommy!) I thought I would post an easy French dinner party menu that I whipped up when she was in DC visiting. The soup, peppercorn sauce, vinaigrette and meringues can all be made in advance so it is pretty stress free (unless you screw up the dessert like I did!). This menu includes all the great French comfort foods but isn’t really heavy. I have tried at least a dozen french onion soup recipes, as it is one of Patrick’s favorites but this is really the best. Petit Trois is a French bistro in LA that I desperately want to try, but lucky for us they shared their recipe with Bon Appetit. I usually just make it with canned beef stock but it is definitely is better with homemade – I suggest making up a big pot one rainy weekend day and just keep it in the freezer for when you want to make this soup. A fresh green salad is the perfect accompaniment to the steak. I like this vinaigrette because of the double punch of the dijon and shallot but any dressing will do. Use pre-washed mesculn greens to make this even easier. I linked to Ina Garten’s method of cooking filets here but if you have a way of cooking them you prefer, by all means. I like the nice crust that searing in a cast iron skillet gives the steaks and then they get cooked through in the oven (a pat of butter on top doesn’t hurt either!). The roquefort sauce in that recipe is delicious but even better is Michael Richard’s Green Peppercorn Sauce, published years ago in the Washington Post. Richard is a world famous French chef that has made Washington his home. Central, his bistro downtown, is one of my favorite spots in the city, especially for a luxe lunch. This sauce is nice and creamy but the real star are the brined green peppercorns. They come in small cans and can last in the fridge forever really. 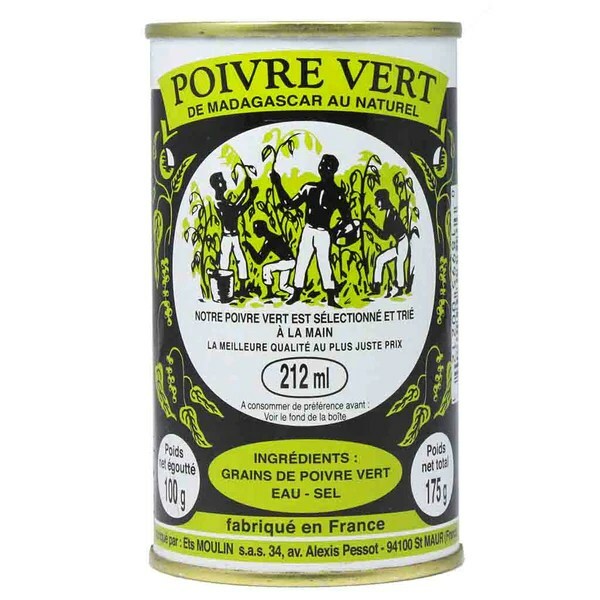 I prefer the ones from Madagascar by Moulin (can below) – they can be sort of tough to find, I have seen them at Dean and Deluca and some Whole Foods. You can also order them online. If you cannot find them don’t try to just use regular green peppercorns – the brine softens them and mutes the pepper taste. As I said the last time I made this meal my mom was in town visiting so I wanted to do something special. Ile Flottante is one of her favorite desserts so I thought I would try my hand at it. If you have never tried it, it’s basically a cloud of puffy meringue floating in a pool of creamy vanilla sauce, usually with caramel or praline crumbled on top. Not bad, right?? Ina has a great recipe that I have used before and fast tracked it by using melted vanilla ice cream as the sauce instead of making creme anglaise. However, here is when getting wedded to a menu item can come and bite you. Even though it was October, DC was experiencing one of those weird fall heat waves and it was pretty humid out. Humidity plus meringues equals no go. They never get nice and crunchy, they basically weep all over the place and are gooey and tough. Luckily my mom is a good sport and we had the ice cream with the praline crumbled on top instead. Pretty delish but not exactly as planned! A good reminder to always have a back up in mind. The good news was that because it was so nice out we were able to eat outside under our pergola with the bistro lights on so it felt like a lovey French cafe right there in Washington. This is a great menu for any time of the year – just remember to stock up on some French wines are well. Gluten Free Not Flavor Free! I think at this point almost everyone has a friend or family member who is gluten intolerant or has celiac disease. More and more restaurants are accommodating these diners and there are a ton more gluten free products on the market. I entertain friends that are vegetarian, vegan, allergic to shellfish, mushrooms, even poultry! However, gluten free was uncharted territory until our dear neighbors the Ryan’s had their cousin Kaycie come and stay with them. As a carboholoic, avoiding gluten sounded like my worst nightmare but when coming up with a menu that Kaycie could eat and others could enjoy I started to realize that there are a lot of terrific options out there. I don’t want to minimize the hassle these folks go through at all, I was only doing this for one night, but if you are careful and conscientious about what you are putting into your food I was delighted to find out you can have a very hearty and delicious meal without gluten. This dinner party feeds a small army (about 8 to 10 very hungry people) and is delicious whether you are gluten free or not. This super creamy soup is really complex with the addition of the apple cider and the toppings of cream, chili oil and chives. I got it from the Edible DC magazine – if you have never checked this mag out you must immediately! The pictures are beyond gorgeous and they have delicious, seasonal recipes. Inexplicably it’s free and just an incredible resource to find local purveyors. You can find it at lots of places around the city like Union Market, most Whole Foods and Glen’s Garden Market (there is also a list on their website). Edible is in several other cities, so if you are not in DC check and see if your city has one. This soup got rave reviews from the youngest guest at the dinner party! Cooking a 10 pound bone in pork shoulder is not for the faint of heart or if you are on a short time frame (it takes over 7 hours to cook!) but is totally worth it. The boys were totally drooling over this somewhat Flinstone-esque roast when it came out of the oven. The pepper crust is so delicious and a great foil to the rich meat. This thing screams for leftover sandwiches the next day so go ahead and get the full 10 pound roast, also keeping in mind that bone is pretty big. If the 10 pound pork roast wasn’t enough for you (I said gluten free not vegetarian right??) then add this easy side of peas sautéed with a bit of prosciutto. It was important to have something green on the table and with frozen peas you add a dash of springtime to a cold weather meal. Polenta is a lifesaver for gluten free folks – since its made of ground cornmeal there is no gluten but it satisfies the “starch” component of a balanced menu. You can use any recipe you like, just make sure not to skimp on the parmesan on top! It’s not a big celebratory dinner party without dessert but I didn’t want to have to resort to ice cream or some sort of gluten free mix. Instead I went with this amazing flourless cake from the Barefoot Contessa. There are no leavening agents in it so it sort of crumples when you take it out of the oven, but never fear that’s what the delicious ganache topping is meant to cover up! Served with cassis soaked berries it’s a super-rich delicious way to end the meal. Little chickens! My husband just loves these and I must admit I am sort of a sucker for cornish game hens myself. I love to serve these for dinner parties – they are no more difficult than a regular roast chicken and there is something so fun about everyone getting their own little hen. As with chicken there are about a million ways to prepare cornish game hens. The meat tends to be a bit more tender so I try to not overwhelm it but this herb butter subtly infuses herb flavor while basting the hen for you. The result is a nicely browned, aromatic little chicky that took all of 2 minutes to prepare. This would be perfect for Christmas Eve dinner – the smell of roasting chicken will permeate the house and make your whole family smile. Preheat your oven to 450 degrees. In a small bowl mix the butter with the herbs and then season with salt and pepper. Stuff the hens with a half a head of garlic each. Use your fingers to separate the skin from the breast meat at the top of the hen, being careful not to break the skin. About a tablespoon of butter under the skin of each hen and then use the remaining 4 tablespoons of butter to rub all over the top of the hens, making sure to cover the legs, wings and breasts. If you have kitchen twine, tie the legs together. At this point you can put the hens back in the fridge and roast them the next day. If you are ready to cook them place them in a roasting pan or on a cookie sheet- they should each have some room on either side of them for the heat to circulate. Use two pans if they don’t have enough room. Cook the hens for 50 minutes (a meat thermometer should read 180 degrees at the leg). Using a spatula lift out the hens and let them rest on a cutting board covered in tin foil for 5 minutes. Meanwhile pour all the juices from the roasting pan off into a sieve over a small sauce pan and cook the juices over high for 3 minutes or so until slightly reduced to a sauce like consistency. Serve alongside the hens. Preheat your oven to 450 degrees. In a small bowl mix the butter with the herbs and then season with salt and pepper. Stuff the hens with a half a head of garlic each. Use your fingers to separate the skin from the breast meat at the top of the hen, being careful not to break the skin. About a tablespoon of butter under the skin of each hen and then use the remaining 4 tablespoons of butter to rub all over the top of the hens, making sure to cover the legs, wings and breasts. If you have kitchen twine, tie the legs together. At this point you can put the hens back in the fridge and roast them the next day. If you are ready to cook them place them in a roasting pan or on a cookie sheet- they should each have some room on either side of them for the heat to circulate. Use two pans if they don’t have enough room. Cook the hens for 50 minutes (a meat thermometer should read 180 degrees at the leg). Using a spatula lift out the hens and let them rest on a cutting board covered in tin foil for 5 minutes. Meanwhile pour all the juices from the roasting pan off into a small sauce pan and cook the juices over high for 3 minutes or so until slightly reduced to a sauce like consistency. Serve alongside the hens.